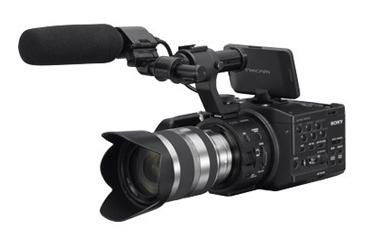 The NEX-FS100UK is an interchangeable lens camcorder featuring a Super 35mm sensor equivalent in size to Super35mm film like that used in the PMW-F3. Developed specifically as a digital motion camcorder it is capable of producing footage with shallow depth of field similar to that of a film camera and capture with high image fidelity. The NEX-FS100UK is includes a Sony 18 ~200mm E-Mount lens. Sony's E-mount interchangeable lenses feature precision-crafted optics with aspherical glass elements for compact high performance, and circular iris mechanisms for smooth background defocusing. The supplied SEL18200(E 18-200mm F3.5-6.3 OSS) with the NEX-FS100UK boasts 11x zoom power, a quiet AF motor for cleaner sound recording, and Optical SteadyShot image stabilization with an advanced Active mode that lets you take steady handheld shots while walking around- even without a bulky stabilization rig. Equipped with a large CMOS sensor equivalent in size to Super35mm film like that used in the PMW-F3, it is able to create a rich bokeh effect (beautifully defocused image) to produce the much-desired shallow-focus look associated with top-shelf commercials and feature films. The sensor also features the optimum number of effective pixels for shooting HD moving images. This new sensor is designed with outstanding exposure latitude and sensitivity to deliver extraordinary HD images subtle in detail and color gradation while avoiding image artifacts typical of HDSLRs.. A tape measure hook and an image sensor position index on the body marks the position of the focal plane. 35mm E-Mount Interchangeable Lens System. The NXCAM Super35 features a Sony E-mount Interchangeable lens system. Due to the adoption of the E-mount interchangeable lens system, a great variety of current and future E-mount lenses from various lens manufacturers (Sony Zeiss, Tamron, Sigma and Cosina) are compatible. Thanks to its unusually shallow flange focal distance virtually any 35mm lens can be mounted via third-party adaptors. Furthermore, with the optional Sony LA-EA1 mount adaptor you can take advantage of the abundant A-mount lenses. 1920*1080 60P recording at 28Mbps. The new PS mode with a 28Mbps bit-rate enables the NXCAM Super35 to capture full HD at 60P. 1920*1080P Slow and Quick Motion (Over & Under Cranking). Recording images at a different frame rate from that used for playback provides the extra versatility of slow and quick motion shooting. The NEX-FS100 enables Full HD (1920*1080) progressive slow and quick motion. S&Q recording plus last scene review permits checking the S&Q effects on-set, immediately after shooting the scene without drilling down menus. HDMI Output with Embedded Time code for 4:2:2 Uncompressed digital output. For extra convenience when using external recorders, the NEX-FS100 provides an HDMI Output with Embedded Time code and pull down markers Signal Output al Output. Simultaneous HD recording to FMU128 and SD or MS Card. Backup/ redundant recording to a memory and optional FMU128 can save time and provide peace of mind. Build-up modular design. Featuring a compact, lightweight body with detachable grip, handle, and viewfinder tube, the NXCAM Super35 can be configured for a wide range of shooting situations. To facilitate hand-held shooting, the angle of the handgrip can be positioned 360 degrees as desired and the LCD Panel can rotate for left or right side operation. Furthermore, there are numerous 1/4- and 3/8-inch screw holes on both the handle and the camera body for mounting the camera or attaching various peripheral devices. Sharp, large and bright 3.5 XtraFine LCD/ View finder. Located on the optical axis, the 3.5-inch-type XtraFine LCD panel enables easier, more intuitive framing, especially during hand-held shooting. And the LCD panel can be rotated for stress-free operation from either side of the camera. For easier, more precise focusing, a large Viewfinder tube with 1.2x magnifier is supplied to convert the LCD into a superb viewfinder.. Flexible recording media. Recording to the directly mountable HXR-FMU128 Flash Memory unit allows continuous recording for over 10 hours without changing the recording medium. Simultaneous recording using memory cards and other media is also possible for secure backup when shooting footage that can't be reshot.